The German Giant is my favorite Radish. It's not fancy or hard to grow and tastes great at any size. The Radish may be a cool-weather crop but I continue to have success even in warmer weather. Grow radishes in full sun or partial shade. Plant radishes in loose, well-drained soil. Remove soil lumps, rocks, and roots from radish planting beds. Obstructions can cause roots to grow malformed. Add organic matter to planting beds before sowing radishes. Radishes prefer a soil pH of 5.5 to 6.8. Sow radish seed ½ inch deep and 1 inch apart; thin successful seedlings from 1 to 4 inches apart in wide rows depending upon the variety. 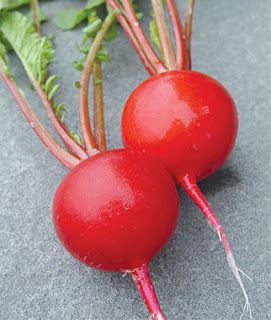 Sow radishes in the garden 2 to 3 weeks before average date of the last frost in spring. Sow succession crops every 2 weeks in spring and in autumn. Two or more crops can be grown in spring. Radishes require 22 to 70 days to come to harvest. Warm weather can result in small roots. Long days may also cause radishes to flower; plant radishes during the shorter days of spring and autumn. In mild winter regions, grow radishes in late autumn and early winter. Radishes can withstand frost. Keep radish planting beds moist but not too wet. Even, regular watering will result in quick growth. Radishes that receive too little water will become woody tasting. Prepare planting beds with aged compost. Side dress radishes with aged compost at midseason. Radishes can be grown in containers. Sow radishes in containers at least 6 inches deep. Plant radishes in round containers in concentric circles. Move containers to cool locations if the weather grows warm. Companions for radishes are: radish, beet, bush beans, pole beans, carrots, chervil, cucumber, lettuce, melons, nasturtium, parsnip, peas, spinach and members of the squash family. Radishes may protect squash from squash borers. Anything that will help keep them away is worth a try. Radishes are a deterrent against cucumber beetles and rust flies. Chervil and nasturtium improve radish growth and flavor. Planting them around corn and letting them go to seed will also help fight corn borers. Chinese Daikon and Snow Belle radishes are favorites of flea beetles. Plant these at 6 to 12 inch intervals amongst broccoli. In one trial, this measurably reduced damage to broccoli. Radishes will lure leafminers away from spinach. The damage the leafminers do to radish leaves does not stop the radish roots from growing, a win-win situation. Keep radishes away from hyssop plants, cabbage, cauliflower, Brussels sprouts and turnips. Radishes are a good indicator of calcium levels in the soil. 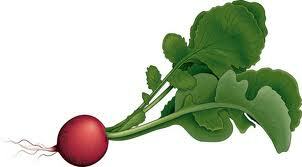 If your radish grows and only produces a stringy root you need calcium. That black radish is fascinating! Thanks for posting. Hello from Healthy Happy Green & Natural. Hi Mary, These radish photos are so mouthwatering! I love the unique flavor of radishes. They enhance every salad I make with them! Thanks for sharing how to grow radish with us on the Healthy Happy Green and Natural Party Blog Hop. I’m pinning and sharing. Thanks for another great article. As a new gardener I appreciate your help and wisdom. Thanks for sharing with Roses of Inspiration. 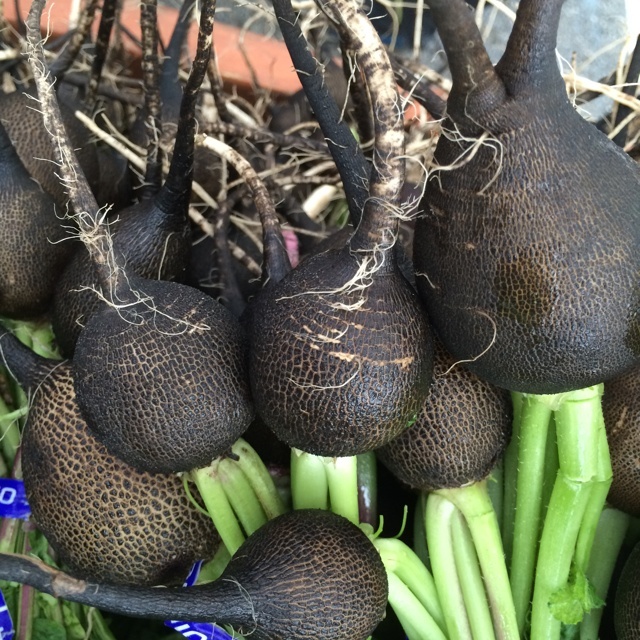 Your radishes look great… those black ones look very different from anything I have ever seen!